The Institute for Machine Tools and Factory Management (IWF) of the Technische Universität Berlin was proud to host the annual conference of the Brazilian-German Collaborative Research Initiative on Manufacturing Technology (BRAGECRIM) this year on October 6-7th 2010. The two day conference was opened by the Brazilian Ambassador H.E. Dr. Everton Vieira Vargas at the Production Technology Center (PTZ). One hundred academic professionals and research engineers, representing 20 Universities in Brazil and Germany, presented their scientific results. 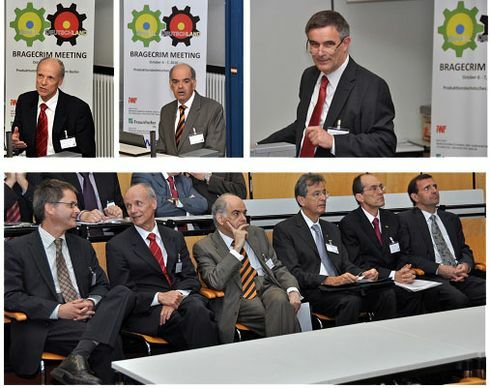 The joint initiative funded by the German Science Foundation DFG as well as the Brazilian sponsors CAPES, CNPq, and FINEP, promotes collaboration in manufacturing research between Brazil and Germany, two key players in production technology. The goal is to facilitate research collaboration in meeting the future challenges of a paradigm change towards sustainable manufacturing on a global scale. The presented results spanned from product and production planning, energy and cost efficient machining as well as knowledge management for holistic factory management. The researchers provided key insights over the entire product life cycle in respect to the future of sustainable manufacturing.